Thankyou for visiting my website.I try to add new material on a regular basis which you can access by selecting the tabs at the top of this page (be sure to click on the "right" arrows to access additional pages-76 at last count) and welcome contributions of original (especially Canadian) material. Although this page normally remains constant you can find new or updated articles by perusing the website with new pages under section one usually. Don't forget to check out the articles under the pull down tabs at the top of this page. 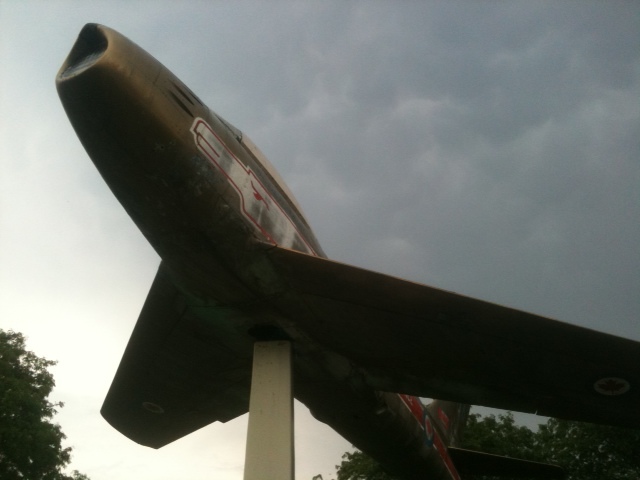 I created this website to talk about my favourite pastime-flying and airplanes. An old friend who was a baseball fan had a big map in his house with every major league stadium he'd visited marked with a coloured pin-it was his goal to see a major league baseball game in every stadium in North America. His enthusiasm for his favourite team, the BlueJays, and the sport of baseball was infectious and it gave me the idea to do something in the same manner by posting everything aerospace I come across in my travels. His goal was to hit all the major league stadiums before he retired, but in my case, there's way too many cool things related to aerospace (and too many airports just in Ontario) to ever realistically plan on taking it all in, even if I limited it to a days travel from my home in Ontario-after all, as the fifth largest aerospace manufacturer in the world, Canadians more than hold their own in the aerospace industry. Nonetheless, I'm up for a challenge and I plan to chronicle as many of the aerospace related things I come across on this website, from airfields to astronauts. 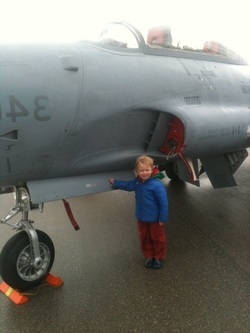 My earliest memories of anything aeronautical were as a small child visiting Selfridge AFB in Michigan with my dad for some great airshows and I've continued that tradition with my own son who appears throughout this website both as photographer and photographee. Check out the site often as I continue to add more articles, photos etc.
. 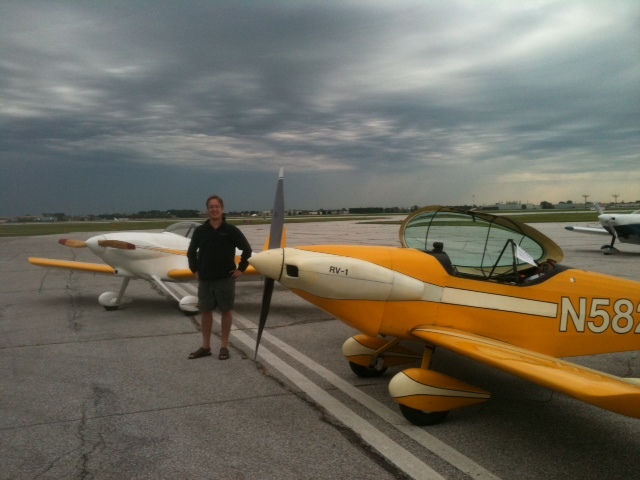 I have been a private pilot for over 30 years and currently enjoy flying in a homebuilt RV-4 based out of Stratford, Ontario. 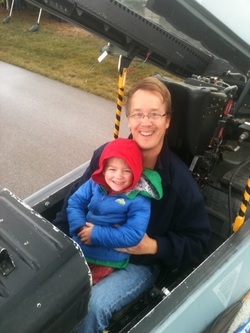 Hopefully, this website will afford me an opportunity to ride shotgun occasionally in some other planes (jets too!) and share my passion for aviation with other like-minded pilots. Send me your best flying stories, tips, places to visit, photos and of course, Ontario airfield/airport via the contact submission box below and I'll post the best submissions here regularly. Make sure you check out all the pages by scrolling through the header and drop-downs... Photo looking West towards Centralia from my RV-4. 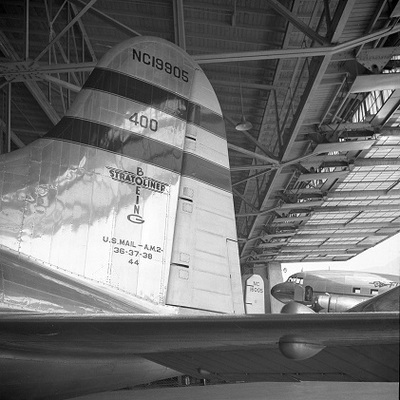 Not many people realize that Howard Hughes made significant contributions to aviation outside of the well known H-2 troop plane, often referred to as the "Spruce Goose" a name which Howard detested, and which was in any case, not even accurate since it wasn't spruce wood. In the 1930's and 40's Burbank airport would most certainly have been the place to go to see the latest and greatest designs and it was there where Hughes had his engineering offices. 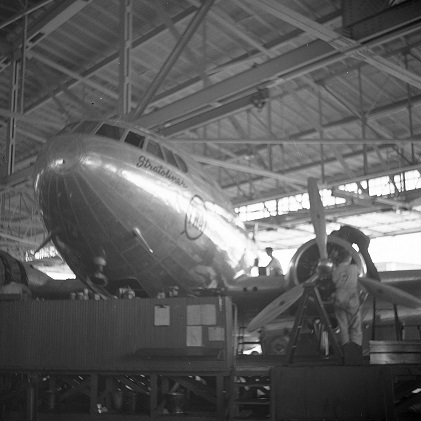 Hughes was certainly a fan of cutting edge aviation technology and when Boeing came out with the first pressurized high altitude commercial transport, the Boeing 307, he was quick to buy one of the first, which he converted into his own flying luxury penthouse- long before Donald Trump was a gleam in his father's eyes.
" The pictures looking down are from Howard Hughes Aircraft walkway (hung from roof) that joined his two engineering departments. We were designing and doing a bit of tests on laminated wood structures for his all wood (mostly) cammera (sic) ship. It was to have the Curtiss Wright 47 (?) cylinder engines. He never got them, smaller engines were used. 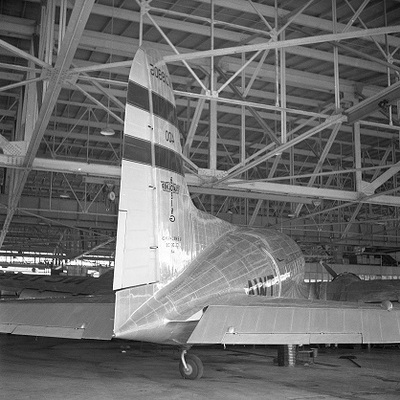 The plane mysteriously burnt up in its' desert hangar." Editor note: the envelope the photos were in, had a hand printed note on the back, "Do not Develop". Not sure why as there does not appear to be anything secretive about the images pictured below, not seen since 1940 when Ken snapped them in the Hughes hangar..
Jpg copies of the photos below available for educational institutions or aviation publications by contacting me at ed@rogers.com. "...On a related note, I discovered a dedicated 307 website that I wasn't aware of until recently. I've often considered making one that's specific to the model and perhaps will still do sometime in the future: http://stratolinerclub.com/. I'm also collaborating with a retired Boeing IT employee who is doing a complete forensic review of all the ten Strats for the Museum of Flight. Incidentally the MOF is extremely interested in acquiring the planeboat for exhibition, a definite maybe sometime in the future. This retiree, Craig Dupler, also has this intriguing theory that one of the Strats that was reported damaged and scrapped in SE Asia could possibly still exist! He has a photo that was supposedly taken after it was reported scrapped taken at a Taiwan CIA airbase of it in the background with its visible tail number that was originally N19908 aka APACHE. He filed a Freedom of Information request, waiting to hear back. I also recently was visited by a gentleman who does restoration work for the Montreal Aviation Museum, who graciously agreed to restore my two hatches that were in severe disrepair. I'm so surprised and very grateful for his help and interest with my craft." Craig writes: "Hi Ed. Thank you ever so much for the note. And the photos you have posted are simply priceless! A couple of corrections to your article regarding what I have been able to establish about the possibility that one of the SE Asia 307's survives. The photo taken on Taiwan is not of the suspected survivor and was taken several years before the missing one simply disappeared. 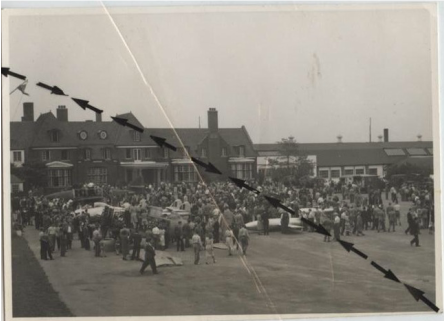 The reason that the photo is significant is that it is the first hard evidence that the CIA was directly involved with the 307's, and possibly arranged for the transfer of the three that were left after the French abandoned them. We'll know much more if the FOIA request coughs up the maintenance data, especially if there are any service reports for either the missing plane, and most especially if any of the records are for work performed either after 1975 or for Mandala Airlines. Either of those would be a smoking gun pointing the way to the possible survivor. As an aside, what I've told Bob Bogash and others is that if the news is positive, I'll first request permission to make a presentation to the Museum of Flight's acquisition and curator team, where I'll announce the positive results first and then send out the email to all interested parties. If the news is either negative or indeterminate, I'll just send out the update right away." Howard Hughes also pursued high performance aircraft design for the Airforce and his F-11 was similar to the P-38 only significantly larger. After crashing the first model, a second was built without contra rotating props (the one shown) but it was deemed too expensive to build. I picked these old photos up from an estate find. 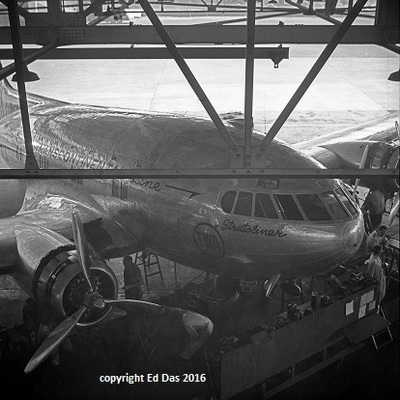 By far and away my favourite airplane photos are those of old shots depicting Canadian aviation history and occasionally, kind collectors allow me to post them on my website to share with everyone. 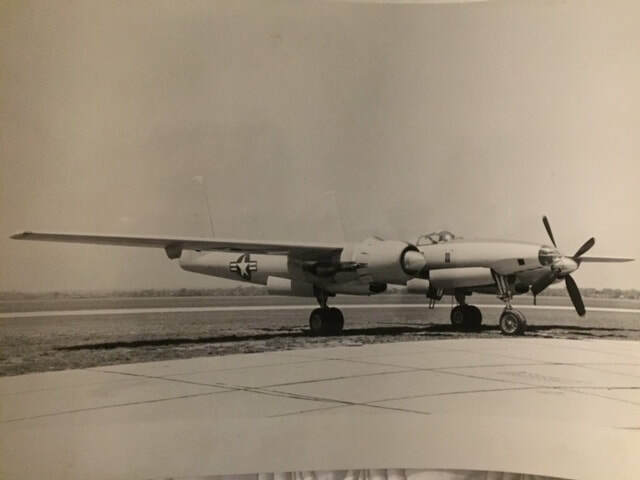 Gary Barrett is among this group of memorabilia collectors who works hard to uncover these gems of aviation history which he sells on ebay and has also kindly also shared with me to present here. The lines through the photos are only meant to prevent people from copyright infringement so that Gary can earn a living, but the pictures are very cool nonetheless. The ME-262 photos below were recently uncovered from the estate of an RCAF public relations officer, R.M.L. Bowdery who was also apparently a squadron leader. Photo 1 shows some German war prizes brought back to Canada at the end of WW11 and are most likely from the RCAF staff college according to Canadian military expert Harold Skaarup. You can make out a German ME-262 (the well-known 509 ME-262 featured on my page about the Mystery of the ME-262 in Canada), a Reichenburg IV, a Komet (likely the one that was later destroyed in Arnprior) and a Vampire jet. 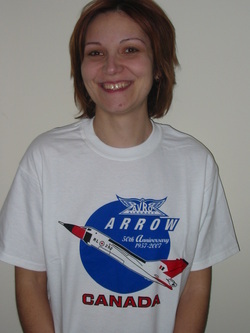 For more pictures, see my page on the Avro Arrow. 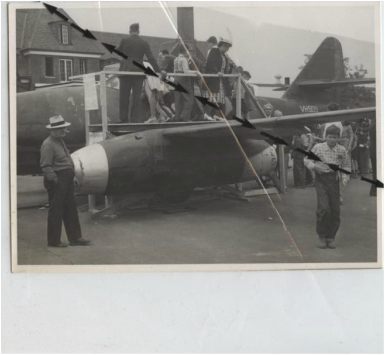 ME-262, ME-163 Komet and Reichenbur IV at Toronto Staff College? '48 or '49? Canadian Forces C-119 Flying Boxcar. 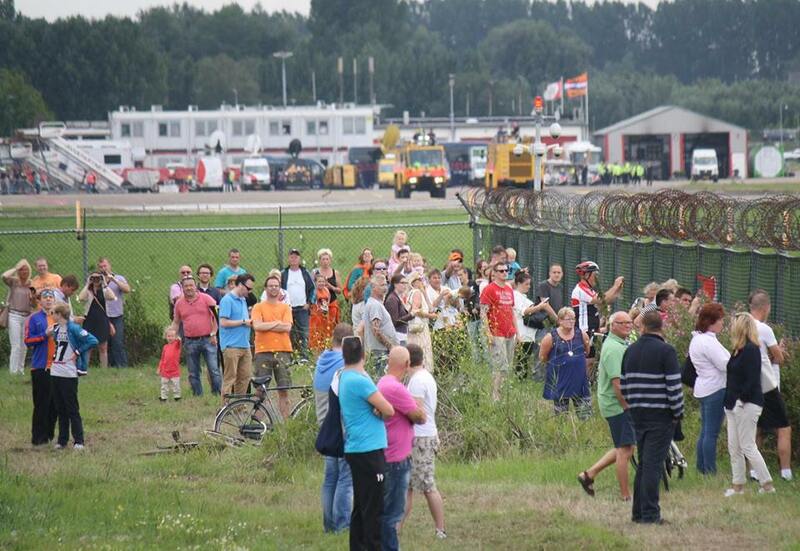 So my Canadian Aerospace Holland correspondent (cousin Robert who flies out of Rotterdam) took these photos of the Dutch National football team returning home at Rotterdam airport to a hero's welcome. "Our CBY-3 restoration began last October and is making good progress. While the aircraft remains outside for the time being we have removed the flight control surfaces (ailerons, rudders, elevators) and the 27 foot long horizontal stabilizer to our restoration building and a lot of work is being done on them by our volunteer staff. 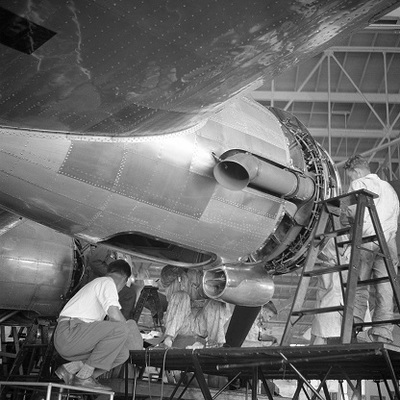 This Spring we plan to remove the wings and begin the interior cleanup of the fuselage. 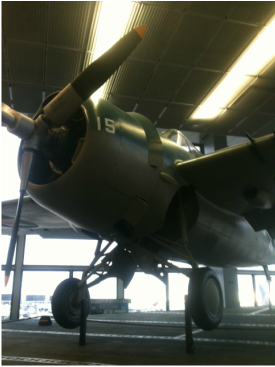 The aircraft is structurally okay but will need a tremendous amount of work to bring it back to display condition. As such, it will be a multi-year project. 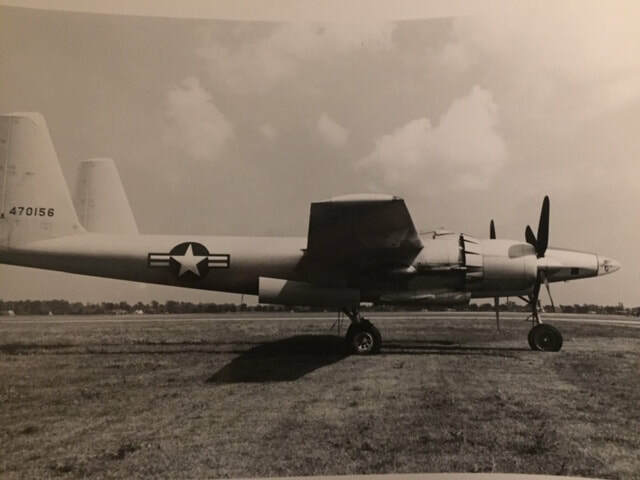 We are also in the process of compiling related artifacts to the CBY-3's history, including pilot reports, photographs and memorabilia. I am attaching two photos; one of the CBY-3 in Canadian registration, circa 1945, and the other as it appears today. There are also many other photos on various websites on the Internet. Thank you for your interest in this historic aircraft." 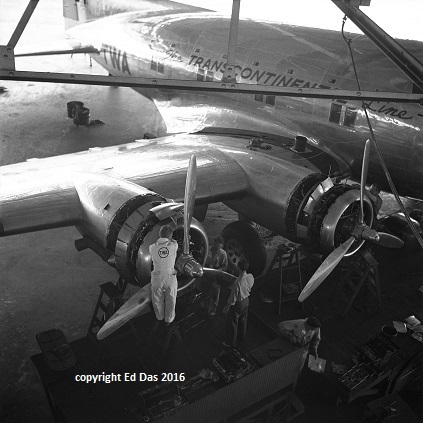 "Work is proceeding on the CBY-3. An all-volunteer crew of 8 people is involved. We are still in search of funding for the restoration in order to purchase missing and unusable parts such as tires, propellers, engine mounts and cowlings, as well as some smaller (but expensive) bits of hardware - bearings, latches, etc. The weather socked us in before we could remove the wings and get them inside so we've been focusing on restoring the twin tail booms, horizontal stabilizer, flight control surfaces, engines and cockpit instrument panels, all of which require extensive refurbishment. Over the last month we have built a tail section assembly rig and have mounted the booms, horizontal stabilizer and vertical fins. We are now in the process of test fitting the three elevators and two rudders. Once they have been fitted properly we will remove them again and begin the process of applying the fabric to these surfaces. This is all proceeding quite well. As soon as the weather breaks we are prepared to remove the wings and move them and the fuselage into our restoration building. 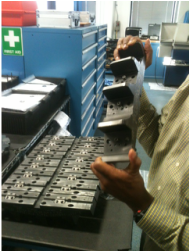 These main components will require many months of major work." UPDATE JANUARY 2014: After contacting numerous owners of CL-215 aircraft, the four tires have been graciously donated by the MNR in Sault Ste Marie so as soon as their CL-415's come in for winter maintenance and the tires are replaced with new ones, we'll have a decent set of four tires to be used on the CBY-3 restoration. Anyone with connections in the transport industry who might be able to provide some donated space in a trailer and transport costs to either Kitchener, ON or to the museum in New England, can contact me at ed.das@rogers.com. 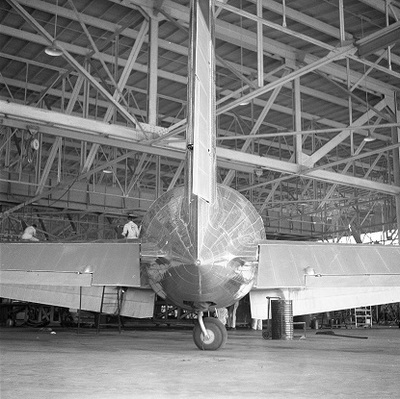 We still require two tires for the tail end which are the same size as those used on the DC-3. donations of gently spent tires are most welcome. In a really great example of the spirit of friendship and camarederie that exists between my two favourite countries, Canadian-owned Manitoulin Transport (owned by brothers Gord and Jeff Smith) graciously organized free transport, along with Customs broker assistance of the MNR tires all the way to their American counterparts at New England Motor Freight in Buffalo, who have similarly agreed to handle the freight the rest of the way to the New England Aviation Museum. Thanks to these two companies who have made a big contribution in helping maintain this historic aircraft ! Loadmaster in it's Canadian livery. It's going to be a tight squeeze! F-89 Scorpion on right. A litttle more evolved than the Loadmaster but clearly, the design has influenced this aircraft. New used tires courtesy of the MNR. 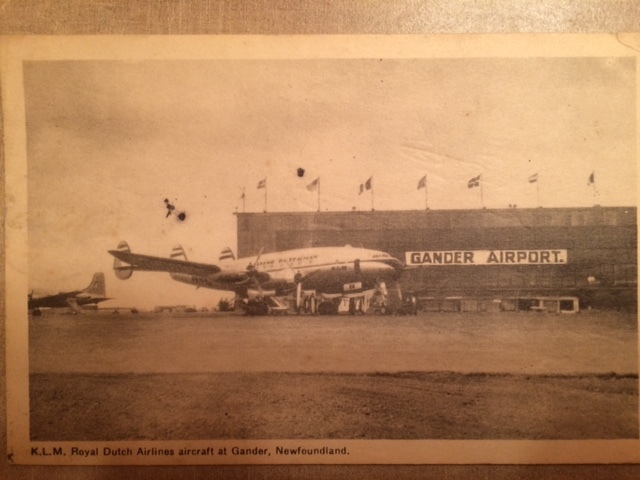 If you would like to contribute to this significant piece of Canadian aviation history, I am currently searching for four tires for Mr Newman to use for static display purposes only. 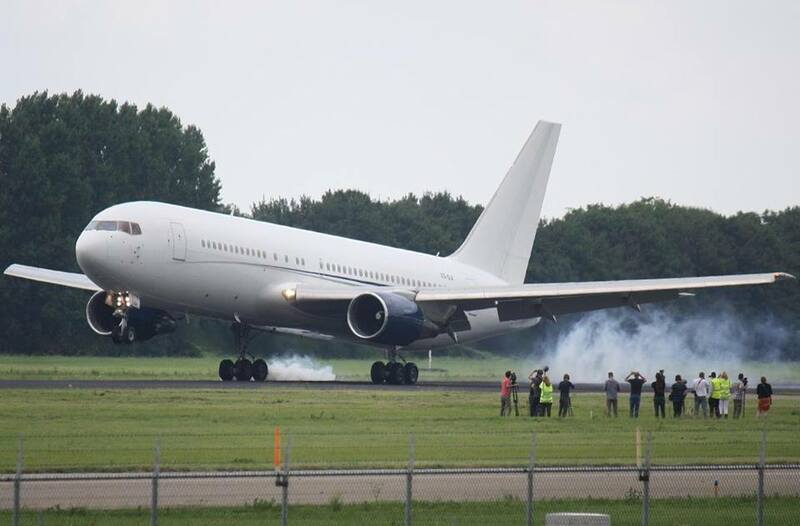 The tires are the same as those used on a Canadair CL-215 (15-16.00) so if you know someone with some used tires they no longer require, please contact me at ed.das@rogers.com. UPDATE JANUARY 2014 The kind folks at the MNR in Sault Ste Marie have graciously donated four tires from their Canadair CL-415 water bomber (as soon as they are swapped out during winter maintenance for new ones) to be used on the CBY-3, so all we need now is a transport company with a little extra room in one of their trucks to donate some space and transport from the Sault to either Kitchener Ontario, or all the way to New England where the restoration is taking place. Contact Ed at ed.das@rogers.com if you can help. 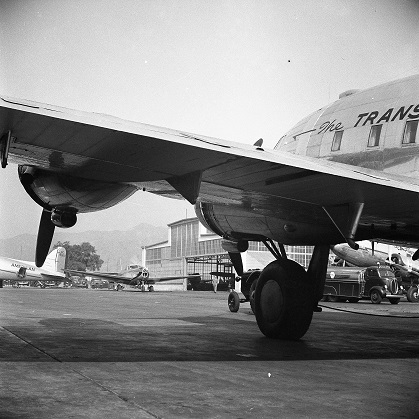 If you happen to own a DC-3, we still need two tailwheel tires for the back tires on the CBY-3 which fortuitously, are the same as it's legendary counterpart. update September 9/2014 all four tires arrived at the museum. I'm Larry Pope. I live in the Austin, Texas area. I've been working on Burnelli designs since 2006 and have been involved in the restoration project with NEAM. 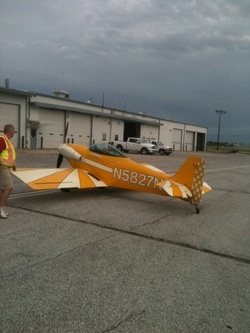 You can see some of my work at http://www.burnelliaircraft.com/wp/blog/ . The picture shows the only known RC model of Burnelli's last design before his death in 1964, the GB-888A, a 400 to 500 passenger airliner. Here is some of the family of Vincent Burnelli visiting NEAM last year. https://www.neam.org/restoration-burnelli-2016-06.php . They're very excited that this plane is finally going to be featured to show the visionary ideas of Vincent Justus Burnelli and the belief of the Canadian Car and Foundry that this could have been the future of flight. Harry Newman says that they may paint the CBY-3 this summer. That would be awesome. I think it was great for the Canadian Car and Foundry to take on Burnelli's designs and produce this last rendition of his work. They actually built a full scale, 3 engine bomber mockup. The plan was to build bombers for WWII but that plan was scuttled by Roosevelt, as you made reference to. 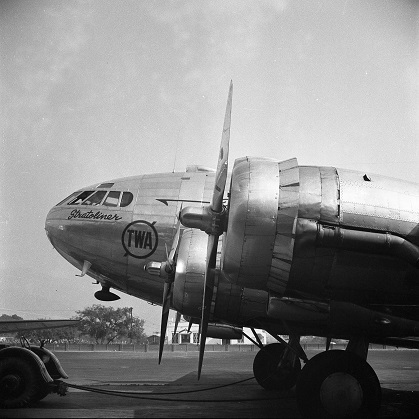 There were plans for a 100 plus passenger airliner after the war too, the B-1000 http://www.burnelliaircraft.com/wp/pics/ that was also to be built by the CC&F. 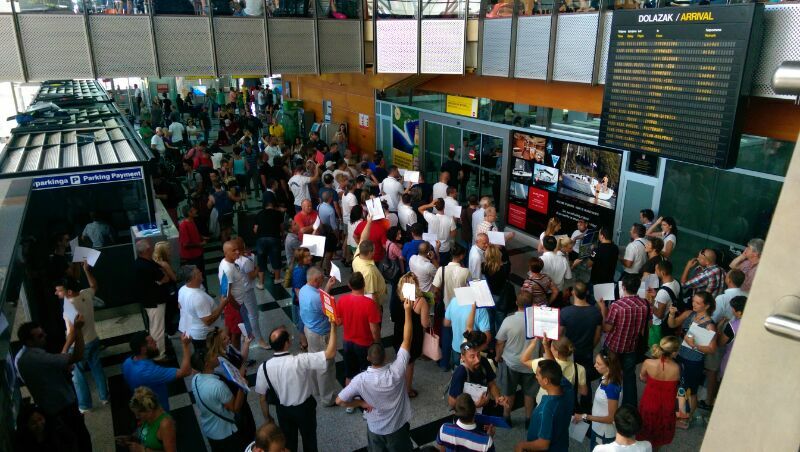 What a loss to the future of flight because of one man's arrogance and petty grudge. 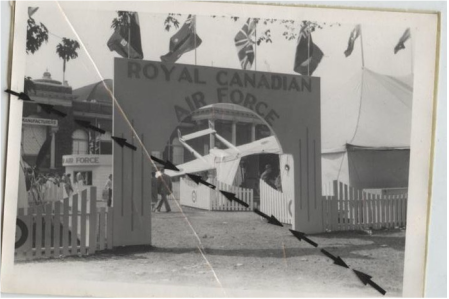 Just wanted to share a little more of the history of the Canadian Aerospace vision and hope from the 1930's and '40's. Thank you for the original post of the CBY-3 on your site. Attached are some pictures of the CC&F Tri-motor Bomber that showed up on ebay a few years back. This was a large plane. With its large fuel and bomb capacity and extended range, it's quite possible it could have hastened the end of the war. It would have changed the future of aviation for sure. Brother-inlaw Aljosa delivers Avro Arrow T-shirt to my other pilot cousin Reinout in Montenegro after two years in transit. 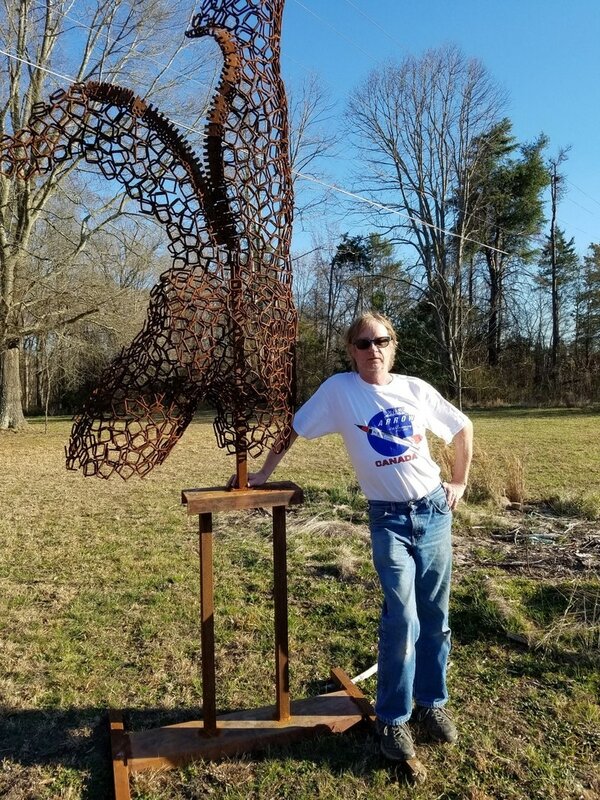 Well known Canadian sculptor, Lawrence Feir modelling the Arrow t-shirt next to one of his sculptures. Cousin Robert at Rotterdam airport, sporting the Arrow T-shirt. Update January 2012: It seems that Dr Mclean is stepping down from his directorship of the Canadian Space Agency. This is a prototype lunar Rover which the company I used to work for (ODG) is developing which the CSA is interested in. One of the engineers demonstrates the ease with which it can climb and descend inclines. Al Capone was one of the most notorious gangsters of American history and Chicago was his stomping grounds. Federal authorities could never seem to nail him on any charges largely in part because he had a very good bookkeeper who "cleaned" his books and made him look like a law-abiding citizen. Although he was amply rewarded financially by Mr Capone, his conscience weighed heavily on him and he vowed that his son would not follow in his shoes. Knowing that his son would one day question his own success, he decided to come clean and eventually surrendered the evidence to the FBI that would lead to Al Capone's incarceration and his own death by said gangster. His son went on to lead an honest and honourable career by becoming a pilot in the Second World war and most notably, diverted a flight of eight Japanese bombers away from his American aircraft carrier singlehandedly shooting down five of them and possibly changing the ultimate outcome of the Battle of the Pacific in favour of the United States. His name was Lt Edward O'Hare, son of Al Capone's bookkeeper and namesake of Chicago O'Hare airport, in honour of America's first combat air ace. 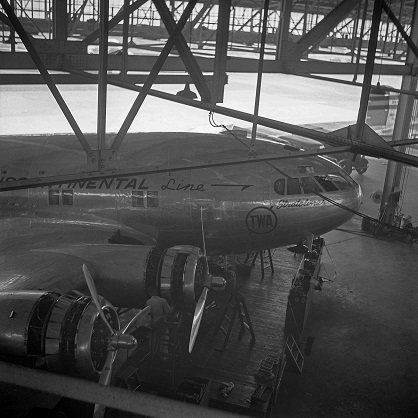 Photo at left is a Wildcat similar to the one Lt O'Hare flew which is located in the terminal building at Chicago O'Hare. Ingersoll Cutting Tools is a company close to Chicago Illinois I had the pleasure to visit and have a tour of the facility. Ingersoll is a manufacturer of cutting tools for the metalworking industry and the very expensive tool pictured at left is one section of a cutting tool that is used to cut the slot in the runner for the flaps on Boeing's 747 airliners. 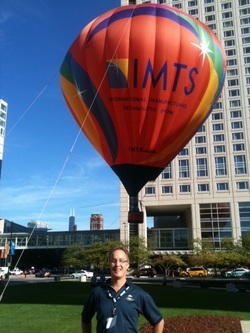 Last week I visited Chicago for the 2012 IMTS trade show, one of the largest machine tool shows in the world. Always on the lookout for an aviation tie-in, this hot air balloon outside of the conference halls was the best I could do. An enjoyable show nonetheless. Same location, 2018IMTS and a little greater BMI. Located in a floral park in Sarnia, this F-86 appears to have been one of the original Golden Hawks, the predecessors to the Snowbirds and notably the first air demonstration team to introduce the two planes flying head-on to each other routine, that is now a mandatory manoeuvre for any fighter jet show worth its salt. This F-86 is now in the midst of a renovation, headed up by my friend Rick West (who is without dispute the best man in Sarnia to head up the project)but will be unfortunately repainted in other colours according to the Sarnia Observer. Update mar 2013 Apparently other Sarnians shared my opinion which I posted to the editor of Sarnia's Observer on the paint scheme of this classic jet- it will retain the Golden Hawks colours and is currently undergoing the 1st stage of restoration. 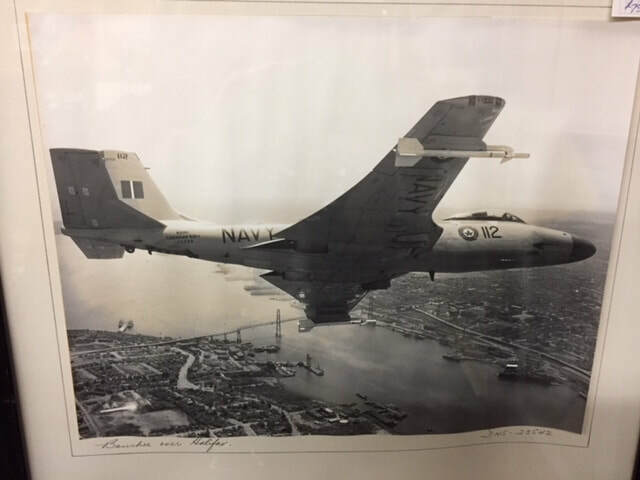 I spoke with Rick recently and he advised that in the course of the refurbishing they discovered serial numbers which confirm this jet was actually one of the leads for the original Golden Hawks jets! Took the plane up for a test ride after a brake repair and snapped this shot of Lake Huron and Centralia airport. 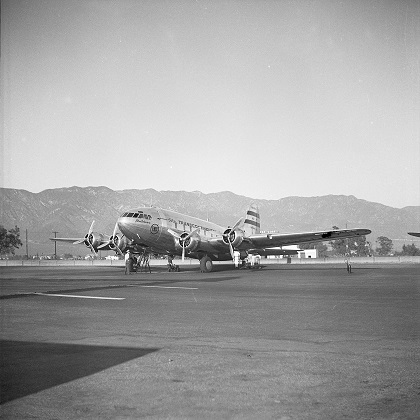 Most of Ontario was the training grounds for the majority of British aviators during the Second world War and a majority of the smalltown airports in Ontario today remain as a legacy of the BCATP (British Commonwealth Air Training Program). The general flatness of the farmland as seen in the photo at left also provided the added benefit that most fields were potential landing strips in the event of emergency. A lot of these airfields (Centralia airport roughly in the middle of the shot) have fallen under neglect as a result of public apathy but fortunately there's still enough support to keep many of them operating if only on a shoestring budget and the help of many volunteers. I don't go to airshows too often (surprisingly), but this weekend I had a couple of free tickets and the pending rain promised to keep the crowds down so my son and I took in the Waterloo ground display. Of course, the obligatory fighter cockpit photo was mandated. The Waterloo show was actually a bit of a disappointment but I suppose since i was a kid, military spending isn't what it used to be and the majority of the small group of display aircraft seemed to come from private collections. But you'd think that the builders of the F-35 would try to showcase their white elephant every chance they get to unimpressed Canadian defence watchers. The T-33 Canadian version was called the CT-133 and instead of Shooting Star, renamed Silver Star after the first Canadian plane, the Silver Dart. Over 600 were built in Canada. An aptly named jet, it really does look like a bat. Foiled by the caution tape. A 1960's Provost, the only one still in flying condition in Canada. This jet (F5D Skylancer) is a direct descendant of the space shuttle and is the only one of four originally built still in existence. http://en.wikipedia.org/wiki/Douglas_F5D_Skylancer. Project DynaSoar (NASA really needs a better PR department- did you really think naming your jet after a synonym for something extinct would conjure up an image of leading edge technology?) called for a winged aircraft that could return from space and land as a normal aircraft. I remember stopping here just outside of Dayton years ago and thinking that it would be in a museum the next time around. 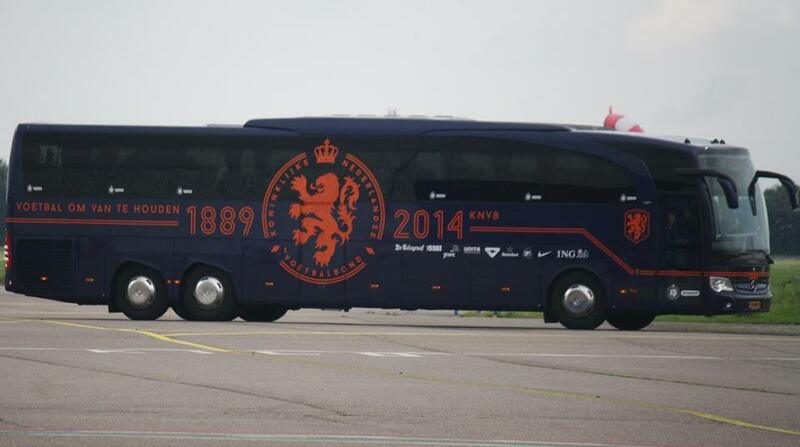 Sadly, it still sits outside. 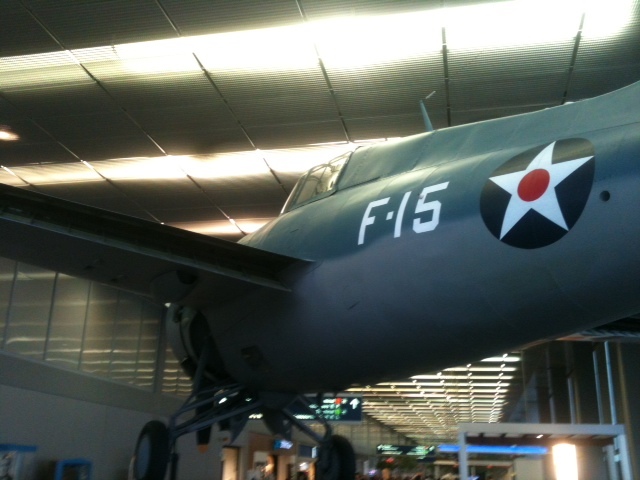 Neil Armstrong flew this-what are you people thinking? Put it inside. Go.........Go.Go.. The first RV ever built (1965), an RV-1, stopped in at Windsor airport on one of two official Canadian stops on it's North American tour, so I decided to pay it a visit. The weather wasn't the greatest so only a dozen or so RV's showed up. I always get a kick out of flying into a small airport and crossing paths with a rare bird or uncommon visitor-in this case it was a T-28 Trojan that dropped by my home airport of Stratford from Fort Erie on a Father's Day tour. This was the primary carrier training plane for the US Navy right up until the 1980's and still sports it's original arrestor hook. Of course, I never miss an opportunity to get a shot with my RV alongside another cool plane. 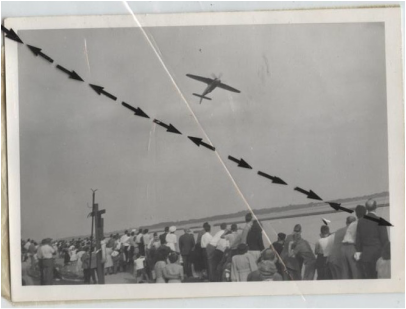 I recently dug up this old photo of my dad's old Beechcraft which was the first four seater I would fly on a regular basis until my dad had an unfortunate landing incident with a tree that was just a little to close to the end of the runway. 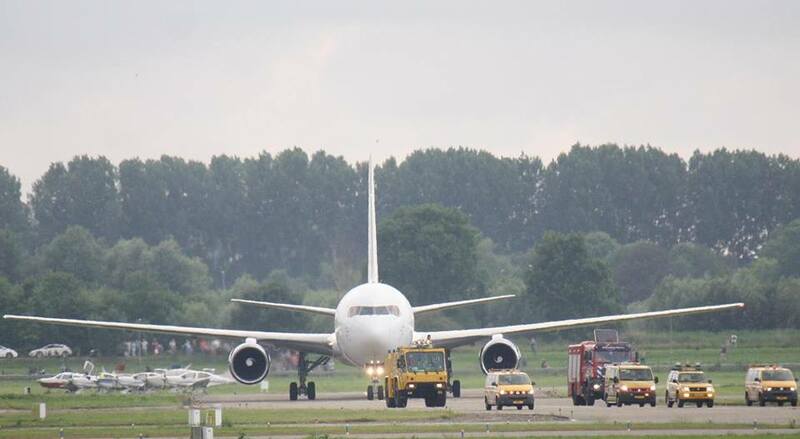 Dad was fortunately unharmed, but the plane not so much. 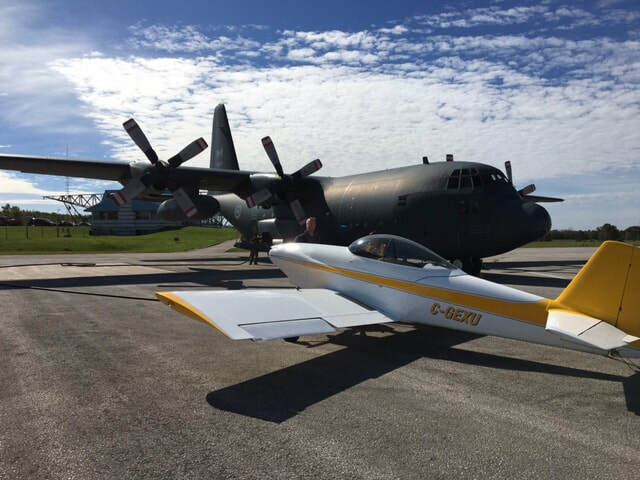 Here's another neat homebuilt in Stratford-a 1/4 scale C-130 Hercules! So this guy decided that he'd design and build his own Herc using Volkswagon engines-pretty cool. It's got a couple of hours on it as of july 2013 and is up for sale if anyone is interested. July 2014 update: Fortunately, there were no buyers foolish enough to invest in a no-plans built, home-engineered transport plane. I really admire the effort of the gentleman who built it, but after not receiving any offers, he trucked it back to his farm and is currently parting the aircraft out. 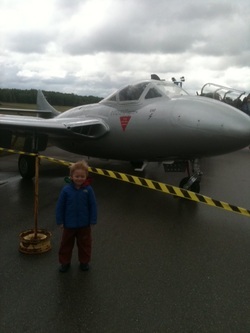 My son checks out dad's plane and shows his approval. Filling up next to a Canadian Forces (City of Hamilton) Hercules at Billy Bishop airport.